"As you get older, your Christmas Wish List gets shorter, and the things on it can't be bought anyway." One thing I always want more of is Time. Time to sew, knit, pursue my own solitary interests. I knew that a day full of hanging out at home in our bathrobes could easily turn into a day full of me cooking, cleaning, and being grumpy that I'm the only one doing chores while everyone else relaxes and enjoys their Christmas. Instead, I specifically asked to be "off-duty" this year. DH and I planned the meals ahead of time, to make sure he could manage them on his own or with some help from offspring. I did pitch in a very little bit to clear tables and load a dishwasher, but I tried to remind myself to leave chores until today, tomorrow, or whenever. And it worked! I had to remind myself occasionally to put down the book, knitting, or get off the computer, wherever my wandering attention had alighted, and stay focused on my sewing project. Because sewing is a multi-step project (the first step being: unearth the sewing table), I rarely get to do it. I can knit, read, try new recipes in one-evening bite-sized chunks. To make clothing, I need a whole day, or even better, a whole weekend. These are rare indeed. I had the idea already, which helped. My friend, Rose, was de-stashing her fabric and patterns, so I scored both the material and the idea for the day's project. She also donated a dress dummy. I've always wanted one of these, and may blog more about it later. It feels very good to go back to basics once in awhile. Everytime you use this apron you will remember the day you made it. Indeed! Happy New Year, Merikay! 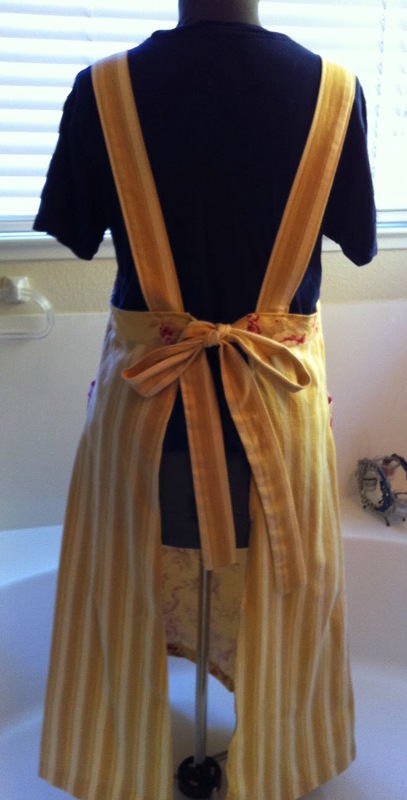 Love this apron, and I'm glad we were able to give you the time to make it!